There are unverified reports of the Egyptian Navy firing warning shots at Iranian warships near Bab el-Mandab Strait, during Operation Decisive Storm. Four Egyptian naval vessels have crossed the Suez Canal en route to Yemen to secure the Gulf of Aden, maritime sources at the Suez Canal said Thursday. Iranian naval forces have successfully saved an Iranian-owned oil tanker from pirates in the Bab el-Mandeb Strait, which connects the Red Sea to the Gulf of Aden. 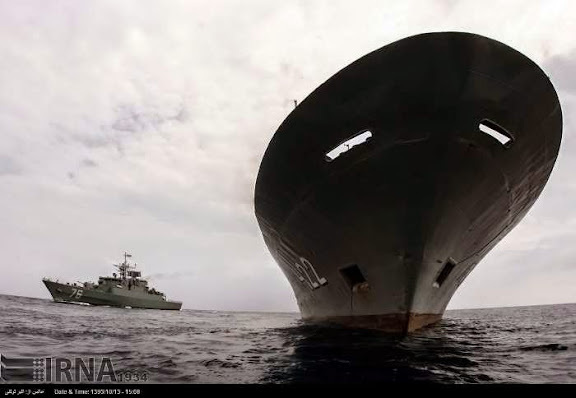 The Iranian tanker came under attack on Wednesday morning after 32 armed people on board four speedboats and a fishing barge laid siege to the ship. The Iranian Navy vessels patrolling the area rushed to assist the vessel upon its distress call. COMMENTARY: The Saudi-led coalition engaging in Operation Decisive Storm is establishing a naval blockade of Yemen. Iran Navy vessels are reported to be operating near Bab el-Mandab Strait. A typical Iran Navy "Fleet" operating at the Gulf of Aden comprises a frigate or corvette, and a logistics vessel. At least one vessel in such a fleet equipped with helipad. There appears opportunity for a naval encounter between Saudi-led coalition forces, and Iran Navy vessels operating in waters near the conflict in Yemen. akhoond rust buckets will become artificial coral reefs if they as much as look the wrong way....! Far from wishing an actual flare-up between the aforementioned forces I have no love for, I wonder what would happen to Egyptian vessels hit by brand-new derivatives of proven Chinese-made C-802s/803s that Iran has been making, upgrading and testing continuously over the years. Let's ask the crew of Israeli INS-Hanit about about coral reefs when hit by an early production variant in 2006, which was several generations away from what DIO produces now with the Ghadir. The IRIN ships are lightly armed when compared to the Egyption frigates. Spokesman for the military operation by Saudi Arabia just announced: We won't allow reinforcements to reach Houthis before the operation (Decisive Storm) is over. I wonder if the new Fateh class submarine is operational? You don't want to try that because it will be costly for Iran losing 12 of its ships in one battle and you can't even see the Egyptian vessels over the horizon and wonder where the hit came from. You do Not want to mess with the Egyptian Navy... Trust Me. Better stay away from Bab El Mandab.